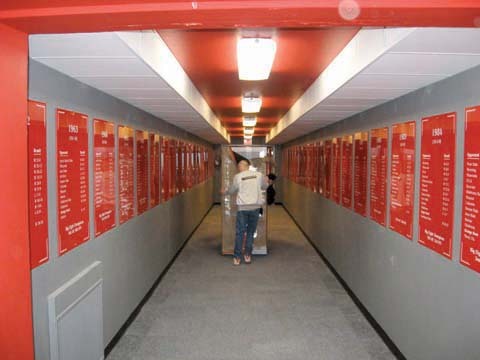 A Von Rentzell employee pushes a rack down the South Stadium hallway that was previously used for the Husker football Tunnel Walk. David Swanson/courtesy photo. The Alan Parsons Project's "Sirius" did not thunder. Rev. Richard Cizik, vice president for governmental affairs for the National Association of Evangelicals, will deliver the lecture, "For God's Sake," at the next E.N. Thompson Forum on World Issues. Cizik will speak Feb. 25 at 7 p.m. at the Lied Center for Performing Arts. Since its founding in 2002, the Rastrelli Cello Quartet has been on a mission to prove that it's possible to play any kind of music on the cello - from baroque to rock. Pianist Ann Chang-Barnes, senior lecturer of piano at the UNL School of Music, will perform with the quartet. Together they will play at the Lied Center for Performing Arts at 7:30 p.m. Feb. 26. College students, unplug your iPods. CENTURY CEREMONY - University and state officials blow out candles during the Teachers College 100 year anniversary event, Feb. 14 at the Van Brunt Visitors Center. Pictured (from left) is Elizabeth Bowen, president of the College of Education and Human Sciences student advisory board; Barbara Couture, senior vice chancellor for academic affairs; Gov. Dave Heineman; Marjorie Kostelnik, dean of the College of Education and Human Sciences; and Ann Masters, assistant to the commissioner of the Nebraska Department of Education. Photo by Troy Fedderson/University Communications. An exhibit of work by Lincoln photographer Michael Forsberg at the University of Nebraska State Museum coincides with the sandhill cranes' arrival in Nebraska. UNL scientists are developing a new approach that delays soybean irrigation until early pod formation in July, relying on stored soil moisture and early-season rainfalls while still helping produce high yields. Authorized by the Legislature in 1904, the University of Nebraska's original Administration Hall was built in 1905 for $35,300. The original cost estimate was $35,000. "Meeting the Other: American and Egyptian Prints" will be on display Feb. 25 to March 7 at the Rotunda Gallery in the Nebraska Union. UNL's University Theatre presents "An American Daughter" by Wendy Wasserstein, at 7:30 p.m. Feb. 28, 29, March 1, 5-8, in Howell Theatre, first floor Temple Building. The Robert Hillestad Textiles Gallery will host the exhibition "Across: Adaptation, Transition, Evolution" through March 12. Thirty alumni of UNL's Department of Art and Art History are contributing art to MEDICI, the department's support organization, for its March 8 gala. The String Beans will perform at 1 p.m. Feb. 23 at the Mary Riepma Ross Media Arts Center. Theatrix, UNL's student theatre organization, presents the New Artists Festival, Feb. 21-24 in the Lab Theatre, third floor of the Temple Building. The Sheldon Memorial Art Gallery will host a College Night 5 to 7 p.m., Feb. 26. Aaron Holz, assistant professor of art at UNL, and Wendy Katz, an associate professor of art history, will speak Feb. 24 at Sheldon Memorial Art Gallery about John Singleton Copley's "Nicholas Boylston," one of the early masterpieces in American art. The UNL Opera program will present Jake Heggie's "Dead Man Walking" Feb. 21-24 in Kimball Recital Hall. Performances are at noon, Feb. 21; 7:30 p.m., Feb. 22; and 3 p.m., Feb. 24. The annual Celebration of Graduate Student Work is 10 a.m. to 2 p.m. Feb. 29 in the Van Brunt Visitors Center. The event is free and open to the public. Megan Schweers (at left), a sophomore finance major and an administrative intern with the Lied Center for Performing Arts, interviews members of the "Flat Stanley: The Musical" during LiedFamFest on Feb. 16. The event featured the musical along with a series of family-friendly activities including hula lessons, coloring stations and an Eiffel Tower construction project. The next LiedFamFest on April 11 features the music of Dan Zane and Friends. Photo by Troy Fedderson/University Communications. There's a world of great interest and significance right under our feet, but most of us don't think to look down. We spend most of our time peering off into the future, speculating on how we will deal with whatever is coming our way. Or dwelling on the past. Here Ed Ochester stops in the middle of life to look down.